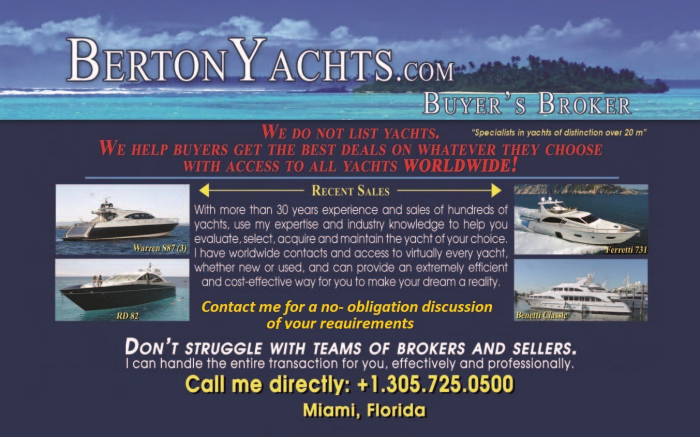 Berton Yachts functions primarily as a Buyers Broker Representative, for yachts in excess of 20 meters, consequently we do not maintain extensive listings of our own client brokerage yachts, but rather have access to all of the yachts on the world market through both proprietary sources, multiple listing services, and extensive personal contacts through the world. These contacts include a variety of colleagues in the marine industry, including brokers, surveyors, vendors, marina personnel, shipping agents, insurance companies, suppliers, etc., and a variety of shipyards. Through these sources we are able to effectively locate and qualify yachts which may not be readily known on the open market, but may available for a number of reasons including trade-in discussions with yards concerning new builds. We will be pleased to have the opportunity to perform a no obligation yacht search for you as an example of our capabilities. Simply contact us by telephone or through e-mail by completing our simple contact form and we will respond promptly and accordingly.